So what did I do about it you ask? 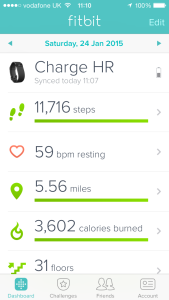 Bought a Fitbit Charge HR activity tracker. Started running 5km three times a week. Changed diet: restricting calorie consumption while increasing protein and lowering carbohydrate intake. Decided to take part in #DryJanuary. Yes, it has. But, before we talk numbers I’ll elaborate a bit on the above. The activity tracker, I’ve been meaning to buy one and play around with it for a few years, I just never got around to making a decision – you know what technology’s like, as soon as you buy something a newer, better model comes out. In the end I just took the plunge and opted for one of the new Fitbits, having used their app without a tracker in the past. Since it arrived in the post, I’ve obsessed over the data it generates, using it for everything from increasing fluid intake, sleeping more efficiently and tweaking my running pace to get the results I want. It has has definitely sold me on the idea of wearable tech and was certainly a worthwhile purchase, one I should have made long. long ago! The running, oh god the running! It’s been a while since I dusted off the trainers and it’s not been easy but I’m getting there. Despite having a very expensive rowing machine in my conservatory and some weights lying around the house, I seldom put them to good use. In the past that’s been because I’m either never in the house for any length of time, or I’m simply busy with other things. Now I’ve reduced my workload, I’ve got no such excuse. But, for whatever reason, running is the only thing that seems to work for me. Not ideal, given that I’m not very good at it and I really hate running (I’m actually a pretty handy rower, and enjoy it to boot). Despite that, I’m out pounding the pavements three times a week and I am improving slowly but surely. The diet, well it goes without saying really doesn’t it, it’s not anything particularly special. Lots of protein from various sources: lean meat/poultry, nuts, fish and eggs. Cutting most carbs out altogether, only leaving what’s required to function efficiently and plenty of fruit and veg for vitamins and other nutritional goodies. While I’ve probably halved (ish) my calorie intake, it’s been pretty easy really. I’ve not turned in to one of those health food nutters, I’m a half decent cook so I’ve manged to whip up plenty of healthy meals that don’t taste the inside of a well-worn croc. Some of these make it on to my Instagram if you’re really curious. And finally, the Dry January. The least interesting really, just something I fancied doing. In fact I tend to do it most years, and sometimes even ‘Sober October’ too. It’s something I used to do back when I worked in food and drink and I was drinking significantly more than I am now. Thinking back on just how much is a little scary. But you don’t really think about volume or units when you’re writing a new wine list, running tasting dinners, attending trade tastings and sourcing new products. So that’s what I’ve done and what I’ll continue to do (with the exception of Dry January), but now you want to hear the numbers don’t you? I’ve lowered my BMI by 2 points. I’ve reduced my body fat percentage by 4%. I’ve improved my running form, and as a result my 5k time. And, I’m beginning to learn how to get a better night’s sleep. This certainly isn’t the end of the story, I’ve still got a way to go before I get to where I want to be. But now I’ve taken these steps, and by continuing to work on them, I’m getting closer to achieving my goals every day. *Correct at time of posting. I’ll update this post periodically with the latest achievements.